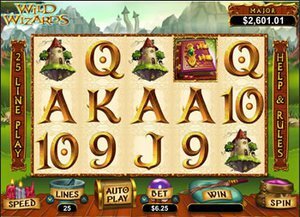 Realtime Gaming has answered critics in a major way with the new Wild Wizards video slot with its over-the-top features. One of the things that online casino software developers are judged on is how often they come out with new titles. While quantity isn't the only metric that matters, it's clear that it does matter to some degree, so even if you're coming out with great games, a lot of people will want to complain if they aren't coming out quickly enough. Realtime Gaming has had to deal with this type of criticism over the past couple of years, and they've decided to answer it by coming out with more frequent titles. The new Wild Wizards video slot is a good example of this, and it's a high-quality game as well. This game uses 25 paylines across five reels with three rows. What makes this particular title really stand out is that it's completely packed with bonus features, and there are five different ways to get in on the action with a bonus round in this game. A number of impressive payouts are available in this game, but what's really crazy is that you can enjoy five different features called Mad Magic, Sorcery, Fireball, Polymorph or the Wizard's Tower. The point here is that you'll get free spins with different types of extras added to the reels that will give you multipliers, added wilds and tons of other goodies. On top of all of this, you'll have a chance at winning a progressive jackpot on every single spin you make. If you're looking to get in on the action with this game, there are a number of RTG-powered online casinos that are offering free spins on this new game to give you a chance to check it out. They each handle these free spins promotions in different ways, so make sure to stay tuned here to see what's available so that you can make the best choices for your bankroll. Sloto Cash Casino for example is offering a huge number of free spins to try out the new game. This site is famous for offering free spins bonuses on new slot machine releases. Overall, Wizard's Tower is looking to be Realtime Gaming's last new release for 2014, and it caps off a year where they have answered critics in a major way.